Oregon Health & Science University's ongoing study has participants discussing memories and tapping their critical thinking skills multiple times each week. 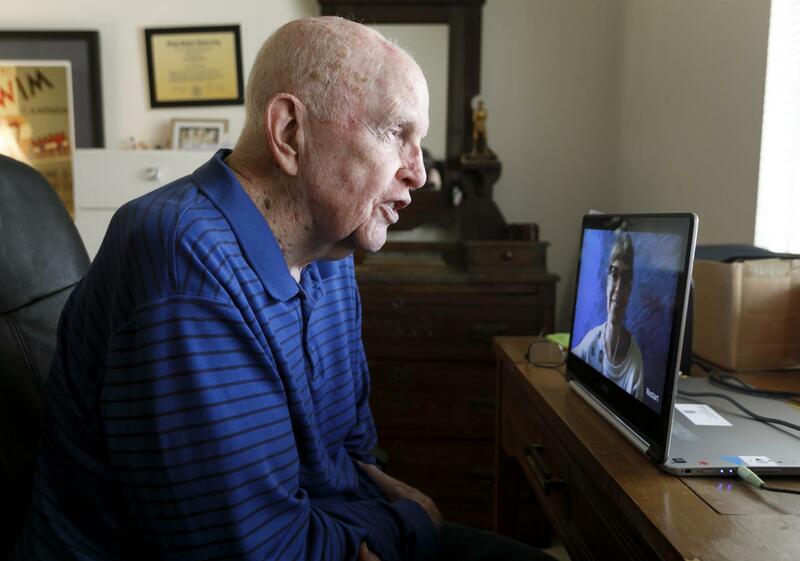 Gene Gilmer, 90, participates in an online video chat clinical trial to see if regular conversation can stave off dementia, Feb. 6, 2019. Credit: OHSU/Kristyna Wentz-Graff. Researchers at Oregon Health & Science University (OHSU) are conducting a clinical trial that explores whether regular tech-enabled conversations might fend off dementia or other cognitive conditions related to cognitive decline among socially isolated seniors. According to a release from the school, the Internet-based Conversational Clinical Trial (I-CONECT) has been running at full steam since the latter half of 2018. In it, trained conversationalists conduct half-hour video calls a few times each week with isolated seniors aged 75 years or older. But the conversations are a bit more than a simple social call. With each discussion, the callers guide seniors through a set of questions and conversation topics that are intended to exercise the brain’s capacity for abstract thought, memory and higher-level executive functioning skills. For Gene Gilmer, a 90-year-old participant and retired school superintendent, these can range from descriptions of childhood radio programs to his critiques of NFL teams’ performances through the regular season and the playoffs. The ongoing project is based off of the results of a 2014 pilot test, in which seniors participating in video chats showed significant improvement in cognition compared to those who did not receive the intervention. It aims to enroll a total of 288 seniors, some of whom will also receive an MRI and be tested for Alzheimer’s disease-associated genes. "This could be an actual clinical intervention your doctor would prescribe — like exercise for a healthy heart,” Jacob Lindsley, a senior research assistant at the OHSU Layton Aging and Alzheimer’s Disease Center and one of the study’s coordinators, said in a statement. Often limited to the confines of theirs own homes, seniors, and those who live alone in particular, are particularly at risk for the damaging effects of isolation. Cognitive health is at particular risk, with regular socialization often recommended as a preventive measure against the development of dementia. If the intervention employed by OHSU researchers shows promise at the end of the trial, it would lend credence to senior socializations strategies employing telehealth and other digital technologies designed to reengage those who find themselves socially isolated. Implementing healthy aging technologies is not only an opportunity to cut healthcare costs, but a necessity when considering the looming tide of aging baby boomers. AARP Chief Medical Officer Charlotte Yeh and other industry heads have frequently put out the call for new technologies targeting isolation, dementia and other issues affecting seniors, and companies like Neurotrack and Brain U Online have answered with products designed to test and improve seniors’ cognitive health.